Blood, a river of life that flows into the body. It includes many components that help to treat different illness and injuries. In fact, world statistics show that blood is the most sought-after body part in the world. This is why donating the blood makes its importance. While there are many other donations like money or clothing, nothing is equivalent to the donation of human blood. Despite the significant achievements of medical science today, there is no factory established that can manufacture blood. It is only in human beings where blood is made and circulated. So with a motive to contribute, Credencys Solution Pvt Ltd put forth its step and took up its responsibility towards this noble cause. The firm organized a blood donation camp in its premises on 29th Nov 2014 in collaboration with HDFC Bank, which has been conducting this social cause program since 2006 along with Red Cross Society. Moreover, banners with motivational contents were also used throughout the campus with a purpose to encourage the employees for their active contribution. 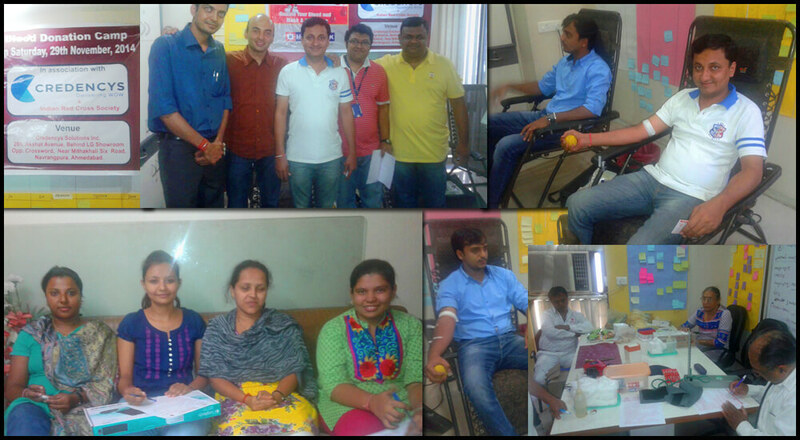 The efforts turned out to be productive when more than 50 employees were reported to donate their blood. After completing a donor registration form, all the participated employees received a mini physical check up including the level of hemoglobin, to make it a safe donation. Credencys is highly excited after experiencing a great success of the event and also planning to keep on involving in such life supporting activities.